I don't know about you, but I love a good blueberry muffin (or 2). There is something so traditional and comforting about them. Preheat oven to 350 degrees. Line a 12-cup muffin tin with muffin liners. Set aside. In a medium mixing bowl, whisk together flours, baking powder and salt. In another medium mixing bowl, beat softened butter with sugar, eggs, lemon zest, almond extract and milk. Fold into the dry ingredients until just combined. Fold in the blueberries. Fill each muffin liner about ¾ of the way full. In a small bowl, mix together melted butter, rolled oats, crushed almonds, brown sugar and cinnamon until combined. 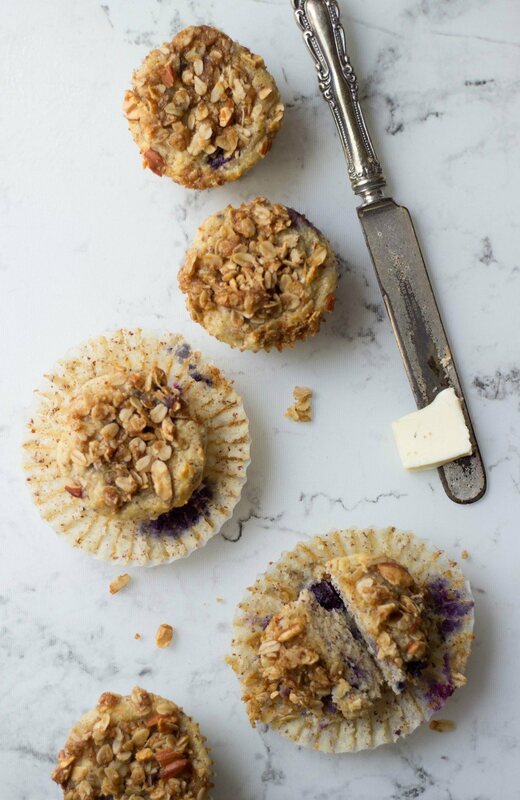 Scoop crumble on top of each uncooked muffin and lightly press it into the batter. Bake 22-27 minutes, until edges are browned and toothpick inserted into the center comes out clean.